Scores of die hard music fans braved freezing temperatures to guarantee front row seats for pop superstar Olly Murs’ return to Scarborough. Dedicated fans queued overnight to get their hands on tickets for the singers gig at the Open Air Theatre on June 8. The chart-topper is making his second appearance at the multi-million pound venue in as many years, after wowing punters during his sell-out performance last summer. Tickets went on sale at The Sands on Saturday morning, and heading up the queue was Scarborough mother Janet Barker. She had arrived with daughter Victoria and her friend Paige Kevan last night - despite the bitter conditions. “It was that cold, I couldn’t feel my toes - that’s dedication for you!’ said Janet. “It was freezing, and we had to go to the loo in pairs, but it was a really good night. The trio were eventually joined by more fans over the course of the night, as ticket hunters slowly trickled down to the Sands to join the queue. Among them was Scarborough woman Julie Veitch, who said: “I came down for about 3am. I had about two hours sleep before hand, so I’m tired now, but it was definitely worth it. When tickets went on sale this morning, around 100 people were in the queue. 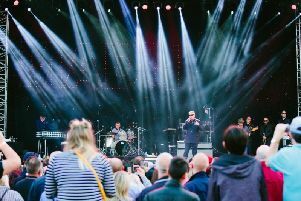 Including Murs, Scarborough Council has announced seven acts for the Open Air Theatre this summer, with further acts expected to be announced in the forthcoming weeks. Ms Dawe was first in line for The Wanted, as well as Gary Barlow at The Futurist, and the gig lover feels the Open Air Theatre is giving Scarborough a “good name”. “I think the council has done an absolutely brilliant job this year. “There’s been a lot of bad publicity on Twitter from people saying that they are not getting any older acts and why are they just concentrating on the younger generation, but that’s the right idea. “Look at Olly Murs - he sold it out last year, and that’s why he’s coming back. “We are paying our tax for these bands now that the council are in charge, so we need value for money, and the acts they are bringing in are the acts that will sell it out. Tickets for the show are still currently available at The Sands, as well as online ticket sites.